I have recently come across a product that can fix the problem of accidental or intentional contamination between DEF and Diesel. This has become a very costly problem for fleets, and a solution is greatly needed. Mixing even a small amount of DEF and Diesel can cause a great deal of problems; we have heard countless horror stories from people who have made this mistake. Click here to read more about What happens if you put Diesel Exhaust Fluid in your Diesel tank. 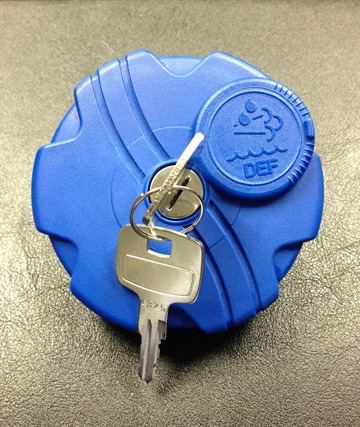 FuelDefend created a special locking blue DEF tank cap, which seems to be a quick solution. While the problem goes both ways for each of the DEF and the Diesel tanks, this blue locking DEF cap will help remind users which liquid to fill, helping many from accidentally filling it with diesel, especially those who are not familiar with DEF. The lock serves to protect it from any intentional contamination and as an extra step before fueling, therefore forcing the user to read more carefully.FuelDefends locking DEF tank cap is non-corrodible, features Zamac coated locks and are available in two styles that fit Peterbuilt, Kenworth, Freightliner, Western Star and Navistar. According to their website they also have two other models coming soon that will fit Volvo, Mack, Hino and Isuzu. I have not come across any company that is using these as a preventative measure. I would like to hear from anyone that has bought these, as well as your opinions and comments.